How to Buy Silver Bullion? When you’re deciding to either start a new investment portfolio or expand an existing one, you’ll want to consider your options. While you can certainly invest into traditional assets like stocks and bonds, an investment in a physical asset can also be beneficial. Precious metals commodities of gold, silver, platinum, and palladium are gaining recognition as stable assets in a portfolio. Silver, especially, has been performing well and is also highly liquid. As you can see, silver has performed tremendously over the past ten years, and recently pulled back from its all-time highs around $46. 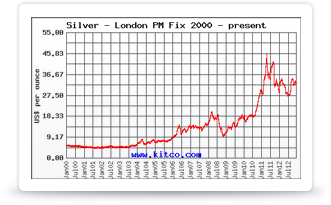 Many investors see the present silver price as an excellent buying opportunity. Next, look up which varieties of silver are available for investment. There are many different investment types, such as physical silver bars and coins, as well as paper silver investments, where you don’t actually hold the silver but you own it regardless. Types of paper silver include government-issued certificates, storage accounts, futures, mining stocks, and exchange-traded funds, among others. This laundry list of investment types can sound intimidating to a first-time investor. Consider your needs to simplify this and figure out what is right for you based on your knowledge of the silver market. Futures trading, for example, involves speculation and knowledge of silver trends, so it may be difficult to master for a beginning investor. However, investment in paper certificates is much more straightforward. Do your research to find the type that suits your needs; whether you require short term or long term investment. Futures trading are fixed for a specific future point in time, and so are better as a short term investment option. For a long term option, silver bullion bars and coins as well as certificates may be an ideal option. Really evaluate your needs and what you hope to do with your silver. If you are using your silver to hedge against inflation and diversify your investment portfolio, you’ll want to consider a silver type that is stable for long term usage and does not depreciate. For this reason, holding stock in a silver mining company is likely not a good idea, as those stocks are quite volatile and don’t exactly track silver prices. If you’re just starting out as an investor in silver, you might be wary of how silver will perform. In this case, you might be more comfortable with a short term investment. In this case, you’ll want to invest in a silver that is highly liquid and easy to sell. Silver bullion bars and coins are popular and liquid. Bullion is available in different weights. For a short term investment, it would be wiser to buy a smaller weight such as 1 or 10 troy ounces, rather than 100 troy ounces. Even if you cannot find another investor to sell to, you can always find a coin collector that is interested in buying your bullion. Once you’ve found the type of silver you want to invest in, you’ll need to shop around for the best deals. Though each silver type may have the same overall market value, bars, coins, and shares are sold at different prices. You’ll want to buy a type of silver that is relatively cheap, easy to sell, and sold by a reputable online dealer.